Dandruff is a form of dermatitis in which the shedding of dead skin cells from the scalp flake and fall off at faster than normal rate. Dandruff can manifest as either very dry and flaky scalp or very oily scalp with flakes. It is important to note that dry scalp and dandruff are not the same condition. Alopecia usually occurs on the scalp; hair loss elsewhere on the body is less common. In the non scarring form of this disorder (noncicatricial alopecia), the hair follicle can generally regrow hair. Aggravated by: According to ayurveda vitiated vata dosha in combination with kaph creates itchy and dryness of scalp skin. Thus dry skin comes out in flakes. Deficiency of vitamins, poor diet, pollution causes for dandruff will lead to weak hair and hair loss. Increased oil (sebum) production (oily hair). Infrequent shampooing / ill maintained scalp. Hair curlers and blow dryers. Use of hair sprays, gels and hair coloring chemicals, harsh shampoos Improper nourishment leading to poor health. 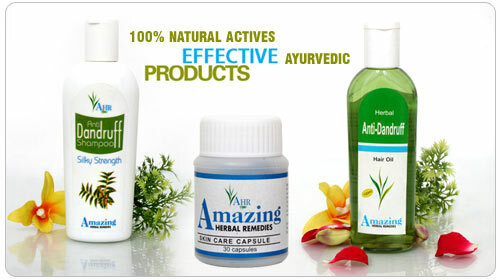 Herbal Skin/Scalp Supplement & its natural herbs helps to balance all three body humor or doshas (vatta, pitta, kapha). Contains specific nutrients that are not easily obtained from dietary sources alone that influence on healthy scalp skin, as deficiencies of specific nutrients can lead to dandruff. Helps to normalize the metabolism of the skin & scalp so that it controls scaling, itching, kills bacterial germs & removes dandruff. It activates blood circulation. Intake: Consume Supplement (1 capsule) once a day with milk or any other milk preparation. Herbal Anti-Dandruff Hair Oil supplies the necessary nourishment to the roots of hair and removes the dandruff from the hair. Stops itching and scaling instantly. Provides relaxing and soothing effects to the scalp skin. 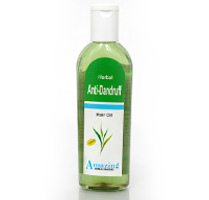 Message the Herbal Anti-Dandruff Hair Oil gently with the finger tips in the roots of the hair. Each application should cover the scalp completely. Apply it once a day at night and wash it in the morning. 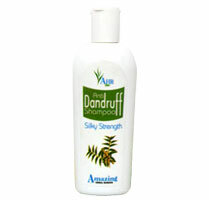 Amazing Herbal Anti-Dandruff Shampoo saves your precious Hair from early death due to dandruff. The herbal formulation unlocks the power of nature, which removes dandruff from your hair. It removes the dandruff. Just step out of shower with healthy hair. 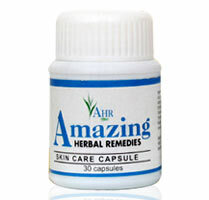 Amazing Herbal Anti-Dandruff Shampoo is recommended for hairs filled with dandruff. Wet Hair, massage shampoo gently on the hair. Rinse & repeat if necessary. In case of contact with the eyes just wash with normal water. 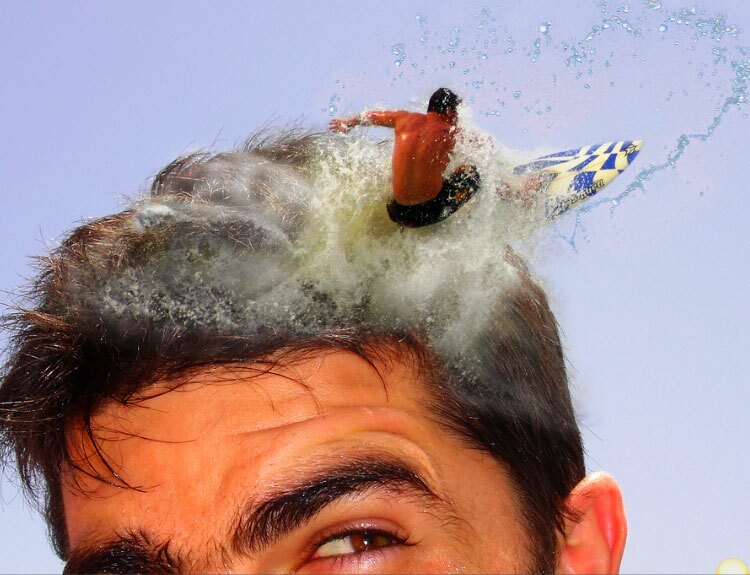 According to Ayurveda poor circulation to the scalp is amongst the main factors contributing to hair loss. Following are few tips that helps inhibit blood flow, particularly to the top of the head, ensuring nutrients and essential elements from reaching hair follicles. These tips helps to activate the sebaceous glands and energies the circulation of blood in the affected area, making the hair grow healthy. Lie down with your legs together and your hands palms down under your shoulders. Rest your forehead on the floor. Inhaling, bring your head up, brushing first your nose, then your chin against the floor Now lift’ up your hands and use your back muscles to raise your chest as high as possible. Hold for a few deep breaths then, exhaling; slowly return to position 1, keeping your chin up until last. Inhaling, come up as before, but this time use your hands to push the trunk up. Continue up until you are bending from the middle of the spine. Hold for two or three deep breaths, then exhale and come slowly down. Inhaling, raise the trunk as before, but this time continue up and back until you can feel your back bending all the way down from the neck to the base of the spine. Breathe normally. To complete the asana, walk your hands in toward your body, straighten the arms, and lift the pelvis slightly. Separate the legs, bend the knees and, pushing out the chest, drop the head back and touch the feet to the head. Breathe normally, then slowly come down, as before. It ensures digestion and prevents excess wind formation. Those suffering from knee pain should not practice this asana. Sit on your knees keeping them together. Draw both toes together, and with heels apart, sit on them. Keep your hands straight on the respective knees. Breathe normally with your spine straight. Relax your hands and release the legs. Now lie on your back or stretch your legs in front with hands at the back and relax. Take rest for 10 counts and repeat. A balanced diet mainly includes proper home made food that is oil free and includes more fresh fruits and vegetables. Add milk to the diet. Below is a list of essential nutrients and how they enhance the hair health and control dandruff. Vitamins B3, B5, and B6 provide health and growth. Vitamins B12 increases energy at the root. Vitamins C improves scalp circulation and encourages growth. Vitamins E increases oxygen intake and expands fullness. Zinc fights bacteria and stimulates growth. Iron maintains the basic health and strength. Folic acid helps to prevent hair loss. Whenever possible, allow your hair to air-dry naturally, Avoid compulsively twisting, rubbing or pulling your hair.. The purpose of shampooing is to remove any dirt or impurities from hair making them clean and tidy. Harsh shampoos will just cause the sebaceous gland to overcompensate by producing more oil than necessary. It is advisable to wash your hair daily or alternate days using Amazing Herbal shampoo or any baby shampoo diluted with water. Stimulates the blood flow thereby nourishing the hair follicles. Prevents hair breakage and split ends. Helps in keeping hair naturally moisturized as this transfer natural skin oil from the roots to the tips of the hair. Remove flaky scales from the scalp. Combing the scalp helps keep your hair healthy and can also promote hair growth. It also an effective way to relax. It, which in turn prevents and fights avoidable hair loss, and re-establishes the natural development of healthy hair. One teaspoon each of coconut, mustard and castor oil can be mixed and massaged into the scalp. One part of lemon juice can be added to two parts of coconut oil and massaged into the scalp. These can be washed after three to four hours or left overnight. Mix up a spoon of camphor to half a cup of coconut oil. Instead of coconut you can use neem oil otherwise. Keep this mixture in a air tight container, preferably a glass container and use this oil to massage your scalp before going to bed. Practice this continuously for at least 15 days and feel the difference of your healthy scalp. After 15 days do it for alternate days for the best of result. Thoroughly rub a thick gel of aloe vera leaves into the scalp; leave overnight; shampoo in the morning. Make a tea of either sage or burdock and use as a rinse after shampooing. Combine olive oil and ginger root and apply to your scalp before shampooing. If your dandruff is really bad, put the mixture on 10-15 minutes before shampooing. Rub rosemary oil or a mixture of olive oil and crushed rosemary leaves into your scalp and leave on for 15 minutes. Add a spoon of castor oil, mustard oil and little coconut (or neem) oil and massage your scalp every night and have a shampoo the day next. This entry was posted in Clinic Remedies and tagged Ayurvedic Shampoos to Prevent Dandruff, Ayurvedic Shampoos to Prevent Hair Fall, Best Herbal Shampoo for Hair Fall, Best Herbal Shampoo for Hair fall control, Best Herbal Shampoo for Hair Growth, Best Herbal Shampoos in India, Herbal Hair Shampoo Plus Conditioner, Herbal Shampoo for Hair Loss, Popular Natural Conditioning Shampoos.